Every object that can read and/or write data is a subclass of the BaseDataSet class, more generally a DataSet is an object that can request dynamic data at runtime. Thanks to its underlying technology Creo is able to show dynamic data directly at design time without running your app. 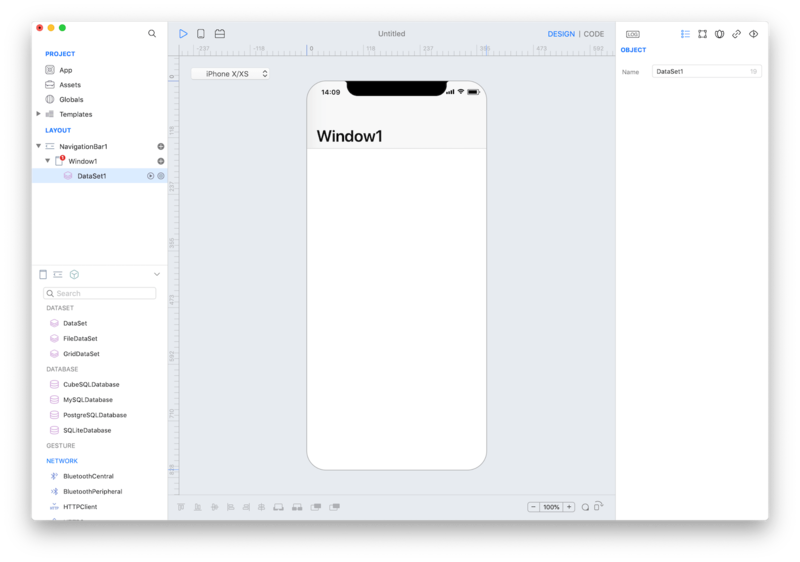 Drop a DataSet object from the DATASET group of the objects panel to a Window and call it "DataSet1"
Add a property named "content" to the "DataSet1"
Drop a TableView object from the COLLECTION group of the objects panel to your Window and call it "TableView1"
Configure the "TableView1" properties from the inspector with the following values: "DataSet1" in the DataSet field (Cell section), "A" (the name of the column) in the Text field (Cell Properties section). Add a Button control from the CONTROL group of the objects panel to your Window and call it "Button1". Execute the project in the Simulator (cmd + R) and click on the "Button1" to set the "content" variable of the DataSet and to reload it, the TableView1 will show the specified content. 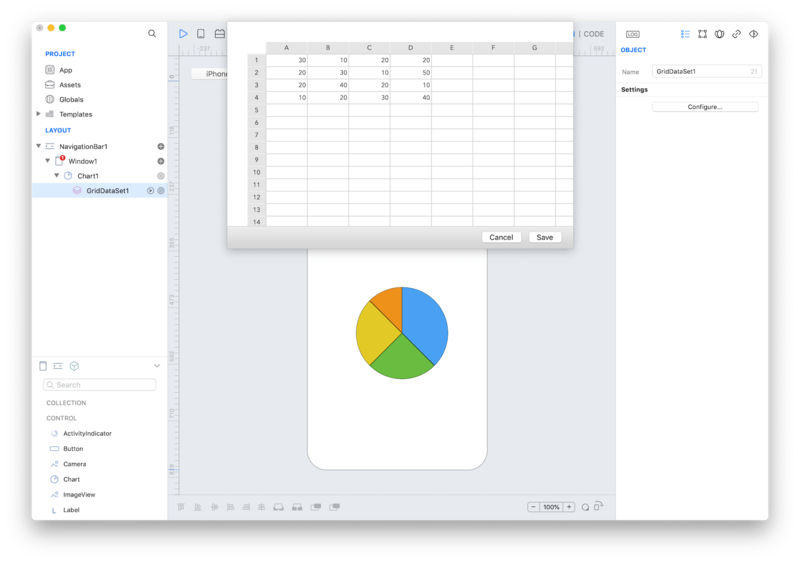 A GridDataSet is equivalent to an Excel/Numbers spreadsheet that you can fill with your data, to edit the data just select the GridDataSet object in the layout panel and press the "Configure..." button from the inspector. Controls that can accept data are bound to a Built-in GridDataSet added as a subnode of the control. For SQLiteRecordSet and SQLiteDatabase classes read the LetsCook tutorial. For more advanced SQLite Database usage read the ToDo tutorial. For HTTPRequest and HTTPClient classes read the Spotify tutorial. For BluetoothCentral DataSet read the HeartRate tutorial. For Assets DataSet read the eBook tutorial. Please note that the sqlite tutorials can be applied for others Databases subclasses like MySQL or PostgreSQL.